Cape Cod, MA. — Having just spent several months on the road and becoming more acutely aware of how many interesting interfaith events are happening near and far, I am happy to make this space available to Dr. Anita Ray, for her report on a recent interfaith gathering just outside Melbourne, Australia. Dr. Ray, who I was happy to meet and work with in Australia in the summer of 2012, is an academic in the Faculty of Theology and Philosophy at Australian Catholic University, with a profound interest in comparative theology. She completed undergraduate studies in Science at the University of Sydney, worked as a clinical pharmacist in various hospitals in India, Pakistan and Singapore, and eventually returned to Australia to complete an Arts degree and PhD in South Asian languages and civilizations. She has taught Sanskrit, Buddhism and Hinduism at Australian universities. The focus of her present research is the encounter in Australia between Anglo-Celtic Christianity and Indigenous spiritualties. She is, as the following report shows, an engaged and perceptive participant in the the lively dialogues taking place in Australia today. Her recent publications include “Doing Theology Inter-Religiously?” in the Australian eJournal of Theology. Please enjoy Dr. Ray’s report, and feel free to add your comments and questions for her. Melbourne. Australia is unquestionably a vast geographical distance from America. This reality has earned it several humorous nicknames, including ‘the last stop before Antarctica’, ‘the antipodean ends of the earth’, and most famously, ‘the land down under’. However, in spite of its apparent isolation from the rest of the world and the existence until 1973 of a deplorable 'White Australia' policy, the country is astonishingly multicultural. The reasons for this are several. Immediately after World War II, the entire population of Australia amounted to less than eight million people and the government recognized that, if the country was to expand economically, it needed to address an acute labor shortage. In addition, politicians spoke frequently about the need for strong military defense against the perceived threat of communism. The Australian government therefore implemented a policy of large-scale immigration, encouraging waves of ‘white’ migrants from Eastern Europe, northern and southern Europe and later from the Middle East. Only after the abolition of the blatantly racist ‘White Australia’ policy in 1973 did an exodus of people begin from Vietnam, Philippines, India and other parts of South Asia. It may be of interest to some readers of this blog that from this time, the Roman Catholic Church in Australia slowly began to inch ahead numerically of the Anglican Church, the religion of the colonialists and settlers, to become the largest single Christian denomination. Today it numbers 25.3 percent of the total Australian population. Even so, it is surely sobering to realize that the demographic shift related more to the arrival of Catholic migrants from surrounding Asian countries than to the missionizing zeal of the Australian Church. The number of Catholics (and Anglicans too, for that matter) who actually attend mass has declined significantly, resulting in the recent amalgamation and even the closure of some parishes. In any event, religious diversity in Australia is here to stay — and this fact raises several important theological questions. Does only my faith tradition enshrine truth? How do other religions deal with matters of ultimate concern? How can we best tackle societal ignorance about other faiths? With these questions in mind, a cluster of academics from the Faculty of Theology and Philosophy at Australian Catholic University set off from Melbourne last Thursday (March 27) to attend an annual interfaith celebration on the Mornington Peninsula. The excursion was remarkable in several respects: our party comprised a Rabbi, two Muslims, several Catholics and an Anglican; our destination was the Hindu ashram at Mt Eliza, a two-hour car drive from Melbourne; and in spite of belonging to a Faculty of Theology and Philosophy, few of our number had ever stepped foot inside a Hindu establishment. For the sake of clarity, I would like to state that each person in our group possessed a strong commitment to her or his home tradition and set out with a genuine desire to learn more about God, about Hinduism and about herself or himself. We were soon to discover that the Hindu devotees at the ashram were similarly dedicated to their own religious tradition (Hindu Shaivism), and that they too shared a desire to know God better. The resident Hindu guru at Mt Eliza, Swami Shankarananda, was the driving force behind the interfaith event. In fact, he has organized the Annual Interfaith Celebration on Mornington Peninsula for the past several years. I could not help but muse that, as in several places in India — Arunachala and Shirdi, for example, where the saintly lives of Sri Ramana Maharisi (1879-1950) and Shirdi Sai Baba (d. 1918) - recall Frank Clooney’s February 2014 blog, reporting on his visit to Shirdi] still attract vast numbers of devotees and pilgrims - a veritable township has grown up around Swami Shankarananda. His passion for interfaith encounters and his generosity of spirit are legendary, known far beyond the precincts of the ashram. Soon after our arrival, we strolled around the beautiful ashram grounds that span several acres. The eucalyptus forest was alive with twittering birds and chirping crickets, but particularly stunning was the ‘Interfaith Garden’ that skirts the lake and boasts an exquisite profusion of roses, dianthus, petunias, salvias, primulas and calendulas. In all, forty residents live at the ashram, devoting themselves to administration, meditation, and teaching various courses in spirituality and yoga. After a blessing pronounced in Hebrew by our Rabbi colleague, we enjoyed a delicious Indian vegetarian meal prepared by the ashramites. Later we joined an assembled crowd in the main meeting hall. By this point, the gathering had expanded significantly, to include three Sufi visitors from India, two Hindus from the Hari Krishna center in Melbourne, a Buddhist monk, a Jesuit priest, a Franciscan, representatives of several other faith traditions and scores of local Mt Eliza residents. After a short musical interlude on the sitar, Swami Shankarananda welcomed visitors and stressed the importance of listening to one another respectfully. He counseled each of us to engage at every opportunity, lovingly and energetically, with those of other faith traditions, and reminded us that relationship is of the very nature of God. The guest speaker for the evening, His Excellency Dr Hassan El Laithy, the Egyptian Ambassador to Australia, told us of widespread terrorism within his country and of terrible social, political and economic upheaval. Nonetheless, he expressed a personal view that the dream of democracy in Egypt can become a reality if only Egyptians “stay connected to God during this dark time of transition” and remain dedicated to peace and justice. “Whatever you do and whatever you say…do everything to the glory of God”, he advised us, in words that had a familiar New Testament ring. The evening concluded with a brief period of reflection and a Sanskrit chant. Judging by the lively conversation on our return journey to Melbourne, each of us found the afternoon and evening an inspiration. The simplicity of ashram life, the openness and warmth with which the ashramites embraced us, their ecological sensitivity and disciplined spiritual practices and the palpable sense of community touched us profoundly, speaking more powerfully than words. Here surely are a people who make time for God. We returned home challenged by their devotion, yet, to be sure, still dedicated to our respective religious traditions. We determined that we would return to Mt Eliza in June when Fr Clooney visits Australia and speaks at their Shiva Symposium. 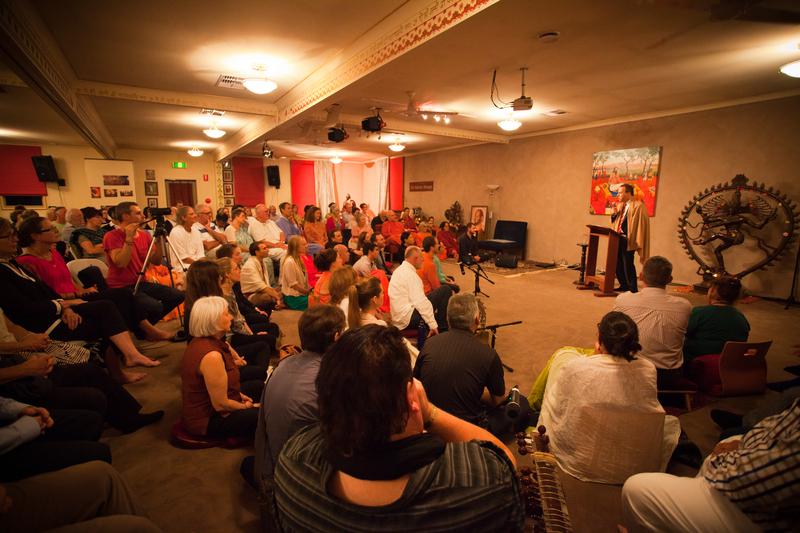 In his most recent blog, Frank Clooney observed that Hinduism does not figure prominently in the American consciousness. Nor does it figure prominently on the religious radar of Australians. However, a remedy to this situation is near at hand: I enthusiastically endorse his suggestion to study up on the topic of Hinduism and visit your local temple or ashram. You may be surprised by joy. Excellent article , we need more tolerance, clear thinking and interfaith understanding like this to progress in a peaceful and spiritual environment. In countries like Egypt and the middle East where people have lived together and intermingled ethnically and culturally for centuries , this level of tolerance is required to heal and bridge and enlighten the darkness and pain inflicted by political intolerance and religious fanaticism.